In this episode, Pepper drinks, Max blows up, and Karl is basically Neo. Ally continues to forget the rules. Galaxy Knights: Super Target Striker playable now! Galaxy Knights: Super Target Striker, a first-person shooter based off the webcomic Super Galaxy Knights Deluxe R, is now out! In this episode, the Boys forget, swim, and meet a really really good dog. Ally also is a fan of this dog. 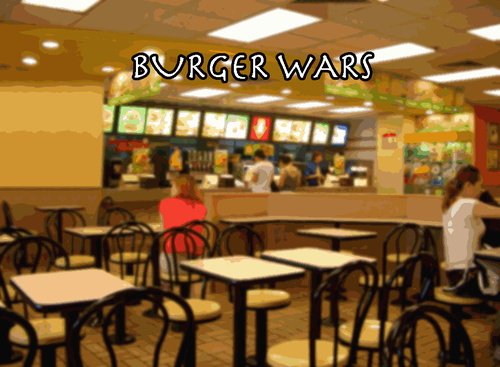 Another new original game, Burger Wars! That’s right! It’s yet another new game! This one is called Burger Wars. I like to think of this one as a social commentary on the modern fast food industry. Click the “Original Games” tab to download! To support Snuffysam Games, buy the soundtrack! Just click the Music tab! Finally, if you want to discuss this game, click the forums link to the left! In case you didn’t notice, for the past few hours, my news post has been mysteriously missing. This is because my Snuffysam Games tumblr, which I use to create this news post, was deleted for some unknown reason. So I recreated it. There’s no way to recover the old posts, but who cares. There was no real useful information anyway.